Welcome to this weeks Critter Challenge! This months Critter Challenge sponsor is Paper Jewels, one random winner from this months challenges will win a Gift Certificate from Paper Jewels. This weeks challenge is a sketch challenge, I enjoy sketch challenges, they're a great jumping point for creating cards. 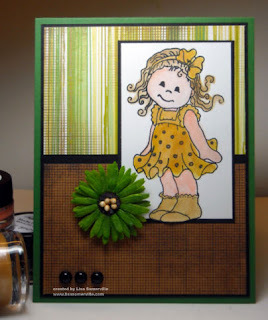 I stamped Little Mimosa from Paper Jewels in Black on White card stock, then colored her using Creative Inspirations Paints. Once dry, I cut the image using the Out of the Box Technique, adhered to my card stock panels, then added the Flower, which I also painted with the paints for some added shimmer. Looking for more inspiration using this weeks Critter Sketch, click on the Critter Logo on my sidebar to see what the other designers created this week. Cute, love the shimmery dress! This is so super cute. I have these same flowers and LOVE them. Great job on the challenge this week. You rock! very nice cards ... will visit you again. off to blog hop now. Lisa--cute card:) I read that today is your bday over on our yahoo group:) HAPPY BIRTHDAY!!! Hope you have a blessed day! Oh wow...that is soooo cute. I love the paints and the technique which I hadn't even seen before! This is so cute, love the colours you have chosen for your image. Love this cute card- sweet image and beautiful coloring! Thanks for the sweet comment on my blog!! :) Love your card here! A very happy birthday to you, Lisa! she is ADORABLE! love it lisa!